There is no one answer to how many calories are needed to keep our bodies in good health at different stages of life. Age, gender, weight and activity levels must be considered. These will all impact on the number of calories a person needs. Figures given in health charts are generally estimates and best used as a guide. Ideal numbers of calories will increase or decrease, even within the same age groups. By ensuring that nutrition comes from low calorie recipes and healthy eating, individuals can be confident that the calories they are consuming are the best kind. A surprising 70 percent of the calories we consume daily maintains essential body processes - like breathing, pumping blood, keeping the body’s organs working, walking and eating. Even asleep we consume calories! A one-year-old baby needs approximately 1150 calories a day. These will come mainly from breast milk or formula milk, and some solids, in the first year. In its first two years a baby grows more than at any other time in its life. It is best to avoid salt and sugar for babies, salt posing a danger to the baby’s kidneys and sugar encouraging a taste for sweet things. 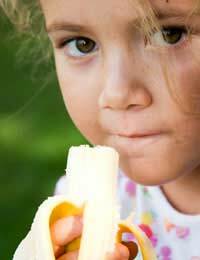 There are foods,however, that must be included to ensure healthy eating for kids. While adults fare perfectly well on low calorie versions of milk, children need full fat milk. Babies should not be fed semi-skimmed before they are two, or skimmed milk before they are five. There is a slight increase in these figures for boys and a slight decrease for girls. Because they grow rapidly, healthy eating for kids is essential and they need proportionately more nutrients than adults. As they approach their teens, another growth spurt will signal a need for even more nutrients. Some of the best of these are available in low calorie recipes. Among 15-18-year-olds the average is 2755 for boys and 2110 for girls. Low calorie recipes will deliver balanced, filling, nutritious meals to meet these raised calorie requirements. Healthy eating for kids is very important at this time, especially since teenagers often develop a taste for fast food or even try experimenting with different food regimes. It is wise for parents to keep an eye on girls, in particular, if they feel too much attention is being paid to calories, or if they notice meals are being missed. Adult requirements vary according to age as well as height, weight, activity and gender. An average 1940 calories daily should be consumed by women and 2550 by men. An adult male who takes little or no exercise and sits at a desk all day will obviously require many fewer calories than a man whose job keeps him highly active, or someone who works out at the gym. In the case of a pregnant woman, there is no need to ‘eat for two’. A mother-to-be can increase her daily average, however, to 2400 calories. This will allow an extra serving or two of energy foods, such as bread and cereals, and extra glasses of milk, or their equivalent in yogurt or cheese, to make sure she is getting enough protein and calcium. Low calorie versions of other foods in her diet will still deliver enough nutrition. It is natural for weight loss to occur as people grow older and appetites decrease. Though less active, however, older people need nourishing foods more than ever in order to maintain optimum health through healthy eating. Use low calorie recipes for soups and casseroles which are good sources of nutrients and fibre. Vitamin C is also important. Probably just as important as knowing about calories is knowing where they are coming from. The aim should be to consume as few calories as possible in the form of fats and sugary foods, which is why low calorie choices are the best option. Ideally, adults should get no more than 27-30% of their calories as fats, and, of those, no more than 8 percent from saturated fats. Anyone who is consuming many more calories than the broad guidelines, and who is considering weight loss, is advised to consult their GP before undertaking any reductions, especially if they are on medication. For a more accurate individual check on how many calories you need daily given your age, size, gender and so on, log on to www.nhsdirect.nhs.uk and to interactive tools.